contact us for equipment pricing and or application questions. we can be reached at (269) 382-2050.
kalamazoo industries youtube channel, sign up today. HSM14 14 inch Kalamazoo Industries semi-auto non-ferrous mitre saw non-ferrous materials such as aluminum and brass stock 45 degrees left or right. The saw was originally was built to a customer’s special request for a rugged, high capacity 14” mitre abrasive chop saw. HSM14 14 inch Kalamazoo Industries semi-auto non-ferrous mitre saw features cast iron construction, 4400 rpm spindle speed, sealed ball bearings, dual V-belt drive, and dual air vises that opens 6” and air/power down feed. Capacities are 4.5” pipe and or square at 90 degrees, and 4” pipe and square at 45 degrees. The saw is available with a powerful 5HP motor in 220 volt 1ph, or 220/440/575 voltages 3ph. These products have application in the following industries: Energy, Oil/Natural Gas, Petro/Chemical, Knife Manufacturing, Automotive, Metal Foundries, as well as many other Manufacturing and Fabrication environments that work with non-ferrous metals. Semi-automatic air/oil power down feed gives smooth bright cuts. Dual air vises hold material solid for consistent cuts. Robust cast iron construction. 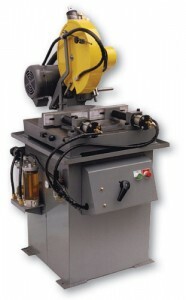 14″ high speed mitre saw for cutting ALUMINUM and other non-ferrous material with steel blade. 5HP, 3ph, 3450 rpm motor. Double v-belt drive. Cast iron contruction! Double air vises, OSHA safety blade guard. Mitres left and right to 45deg. Capacities: 4-1/2″ pipe and square. Shipping dimensions: L 44″ x W 40″ x H 65″. Single phase amp draw: 230V 19.5 amps. Kalamazoo Industries HSM14 14″ non-ferrous mitre saw parts list. HSM14 14″ high speed non-ferrous mitre saw cut sheet.